The following content was provided by the publisher. Hugh Jackman, Academy Award(R) winner Russell Crowe and Anne Hathaway star in this critically-acclaimed adaptation of the epic musical phenomenon. Set against the backdrop of 19th-century France, "Les Miserables" tells the story of ex-prisoner Jean Valjean (Jackman), hunted for decades by the ruthless policeman Javert (Crowe), after he breaks parole. When Valjean agrees to care for factory worker Fantine's (Hathaway) young daughter, Cosette, their lives change forever. This enthralling story is a timeless testament to the survival of the human spirit and "an unforgettable experience" (Richard Roeper, RichardRoeper.com). Director Commentary, "The Stars of 'Les Miserables'", "Creating the Perfect Paris", "The Original Masterwork: Victor Hugo's 'Les Miserables'", "'Les Miserables': A Revolutionary Approach". 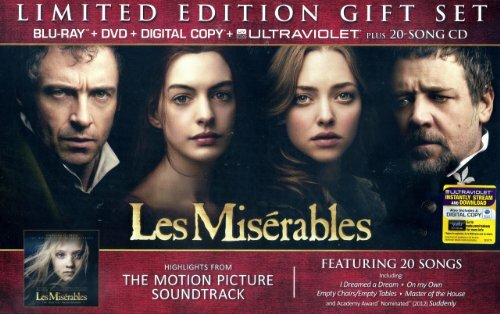 Subtitles: English SDH (Subtitles for Deaf and Hearing Impaired), French and Spanish, Digital Offers Must Be Redeemed by 4/30/2015, My Scenes, BD-Live, pocket BLU App, Music CD: Highlights from the Original Motion Picture Soundtrack including "I Dreamed a Dream", "On My Own", "Empty Chairs/Empty Tables", "Master of the House" and Academy Award(R) Nominated "Suddenly".